This post is the sixth in a series exploring the National Library of Medicine’s rich and varied collection of “herbals,” which are books devoted to the description of medicinal plants (and sometimes other natural substances) with instructions on how to use them to treat illness. The Library’s herbals are some of the most beautifully illustrated books in the collection, and they are full of remedies that have not yet been tested by modern science. Among the Library’s large collection of herbals, a few stand out as among the most beautiful, especially in terms of illustrations. Finely engraved on copperplates with fine colors often carefully added to the pages by hand, these herbals are some of the most beautiful to be found anywhere. 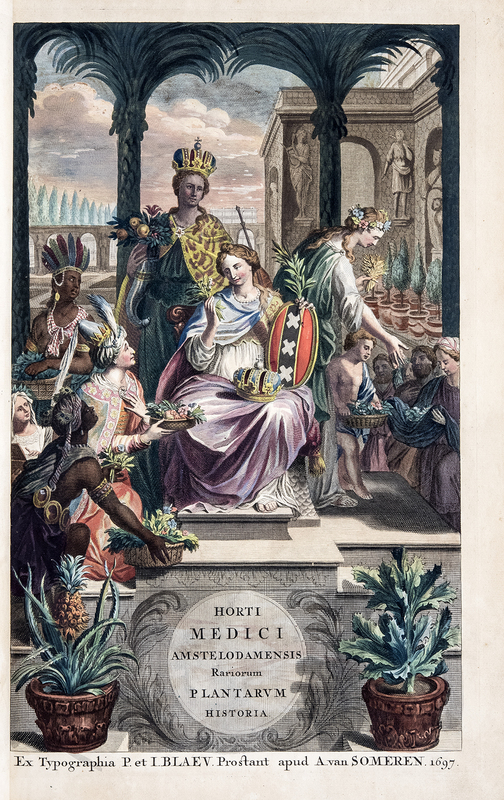 Jan Commelin (1629–1692) and his nephew Caspar Commelin (1667–1731) are largely responsible for the monumental and beautifully illustrated Horti Medici Amstelodamensis Rariorum … Plantarum Historia (Rare Plants in the Physicians’ Garden of Amsterdam), which came out in two parts from 1697 to 1706. Both men served as administrators at the Hortus Medicus of Amsterdam (Physicians’ Garden), which was founded by the city in 1682 as a place for research and teaching about medicinal plants. The Dutch Empire was at its zenith, with trading outposts in lands as far-flung as the Caribbean, South America, South Africa, Sri Lanka, and Indonesia, and the garden was meant as a place to gather, cultivate, and experiment on plants that had been found, hoping to find both medical and commercial uses for them—a colonial endeavor carried out by a number of imperial European powers during the 16th through the 19th centuries. Jan died in January of 1692, and his section on exotic plants from the East and West Indies was then edited for publication by physician Frederik Ruysch and apothecary Frans Kiggelaer and published as the first volume in 1697. Caspar produced the second volume in1701, which included annotations on Jan’s text in the first volume and included plants from Africa. The beautiful images in the book created using copperplate engraving and later hand-colored, were heavily based on a set of watercolors commissioned by the Hortus Medicus to be carried out primarily by the Dutch botanical artist Jan Moninckx (1656–1714) and his daughter Maria Moninckx (1673–1757). Elizabeth Blackwell (1707–1758) was a Scottish botanical illustrator most noted for her beautiful, two-volume folio, A Curious Herbal, published from 1737 to 1739. Born in Aberdeen, she had an unfortunate marriage with her cousin Alexander Blackwell, a physician who landed in debtor’s prison in London in the mid-1730s. In order to relieve the couple of their debts, she took on a commission to illustrate an herbal featuring exotic plants, many of them from the New World, that were being cultivated at the Chelsea Physick Garden, while her husband assisted her with much of the text describing the plants and their medical uses. Not only did she draw the plants, but she engraved the copperplates used to print the images and colored the pages by hand herself. Blackwell’s herbal was issued in weekly parts between 1737 and 1739, each part containing four illustrated plates and a page of text. The plan was a success, and Alexander was freed, only to meet an unfortunate end in 1747 by being beheaded for his supposed involved in an intrigue in the court of the Frederick I, King of Sweden, where he was a physician. Elizabeth Blackwell’s herbal is considered one of the first illustrated and authored by a woman, and its beauty is undeniable. William Curtis (1746–1799) was an apothecary, botanist and entomologist, originally from Hampshire, England. His beautiful Flora Londinensis, published between 1775 and 1798 in 72 numbers (or parts), forming 6 fascicles to be bound in 2 volumes. Rather than focusing on exotic foreign plants, Curtis examined the flora around London, giving not only full descriptions and nomenclature, but also their medicinal uses and methods of cultivation. Apprenticed as an apothecary, his first ventures into research were in the study of insects, including a translation of Carl Linnaeus’s Fundamenta Entomologiae in 1772. He held curatorial positions at the Chelsea Physick Garden from 1772 through 1777 and later at the London Botanic Garden at Lambeth Marsh. Curtis’s Flora Londinensis established his reputation as one of the foremost English botanists of the 18th century, and many of the beautiful plates are considered some of the finest illustrations of British plants ever produced. This article is the sixth in a series about NLM’s large and varied collection of herbals dating from the Middle Ages to the 20th century. To learn more about them, please feel free to contact the Library at NLM Customer Support. Michael J. 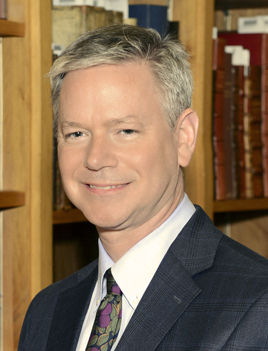 North is Head of Reference and Reader Services in the Rare Book and Special Collections Division of the Library of Congress, and formerly Head of Rare Books and Early Manuscripts in the History of Medicine Division at the National Library of Medicine. He recently left the NLM after 15 years of service, and we wish him all the best in his new position. As a Hampshire woman I’m glad you value Curtis’ work. Good to hear from you! The plates in Flora Londinensis are so lovely. Linnaeus’s system of botany, so far as relates to his classes and orders of plants … : with copious explanatory descriptions : drawn up for the use of his pupils from 1777. “Beauty is undeniable” – True to every word. The drawings give us a near realistic view of the plant and its parts.